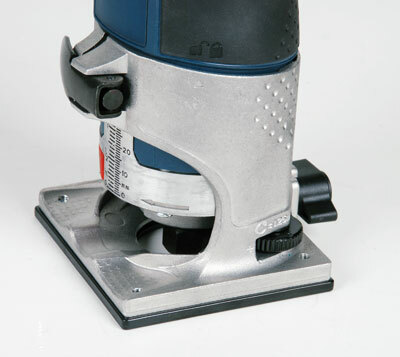 Laminate trimming is something that we router users will inevitably carry out at sometime. 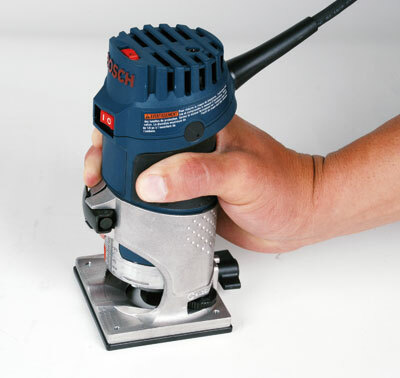 Countertops are a major part of any interior project and having a dedicated laminate trimmer is essential. You need a light machine, and one that is easy to manoeuvre around corners but will also cut straight if needed. The motor capacity need not be great as the workload is fairly low, but you will need a motor that will keep on running for lengthy trimming runs. 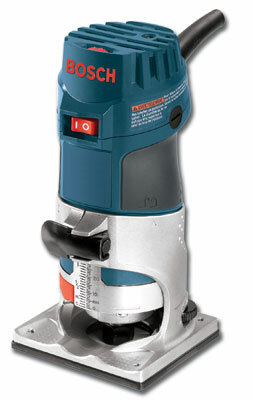 This new GKF 600 trimmer from Bosch features a variable speed 600W motor with a speed wheel that is placed on the top on the body. Although the trimmer is comfortable to hold and use one-handed, you will need to use the other hand to change speed. The on/off switch can be operated with the one hand, which is useful. The trimmer is well balanced with a nicely made base that is well thought out for all trimming projects. There is a fine depth control on the base that moves the cut up or down by 3/64in with one rotation of the knurled wheel. The clamp lever on the front of the trimmer locks the depth setting securely, and a quick twist of the body will release it so it can be removed from the base. The trimmer features a spindle lock for single spanner bit changing and its 1/4in collet is of a good standard. Also in the blow-moulded carry case is a straight edge guide that fits onto the base and tightens in position with a nice-sized knob. The guide is fairly rudimentary but does exactly what it is supposed to - guides the trimmer straight. This is a great little tool that is light, powerful and versatile. 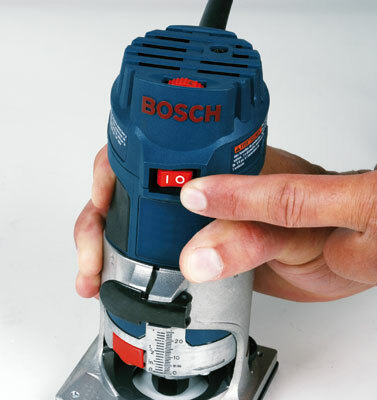 With a price of £140 this Bosch trimmer is not only a good performer it is good value for money. "This is a great little tool that is light, powerful and versatile"